What is a .help Domain? With the .help domain, you can provide your readers or customer with all the assistance they need. This unique generic top-level domain is available to anyone without restrictions. It’s a versatile alternative to traditional extension options. As a result, it has been adopted by thousands of companies and individuals in a wide range of industries. The main purpose of the .help domain is to simply give web users a recognizable destination that they can visit anytime they need assistance with a certain task or project. As a website owner, you can become a trusted source of advice and mentorship. The domain shows that you’re knowledgeable in your field and ready to provide assistance whenever it’s needed. Why Choose a .help Domain Extension? The Internet is an endless source of information at your fingertips. Despite the millions of pages that are available to look through, most people are looking for a single, reliable source of information that they can return too often. You can become that source with a .help domain. Whether you’re experienced in a professional field of study or you’re simply a talented hobbyist looking to share your passion, the .help domain can connect you to an audience that’s eager to learn. The .help domain is a great tool for domain hacking. You can easily create a URL that’s easy for your audience to remember. For example, if you run a blog that’s dedicated to providing tips and tricks for new gardeners, you can call your website Gardener.help or BlackThumb.help. Both of these examples show potential visitors what your website is all about, all in a small phrase. 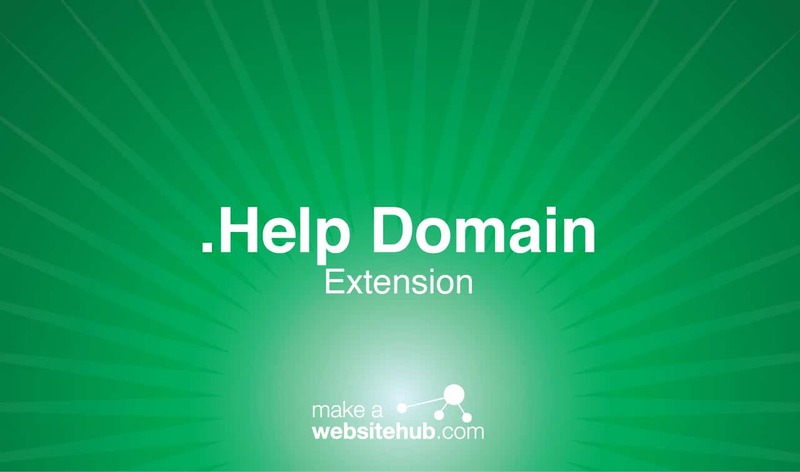 Another way you can use the .help domain is as an extension of your current business website. You can create an entire support section that’s dedicated to answering questions about your business. To do this, all you would need to do is have a CompanyName.help address. Where Can You Buy a .help Domain Extension? You don’t need to belong to any industry to use the .help domain. That’s the beauty of it. Anyone can register the domain to help people across the world. It’s available from some of the most popular domain name registrars. Check out a few below.